Philippine President Benigno Aquino Thursday declared Chinese New Year an official holiday, ignoring the objections of some in the business community who say there are already too many public holidays. It means the Chinese New Year, also known as the spring festival or lunar new year, will be celebrated annually from January 23, 2012. "The joint celebration is a manifestation of our solidarity with our Chinese Filipino brethren who have been part of our lives in many respects as a country and as a people," Aquino's order said. 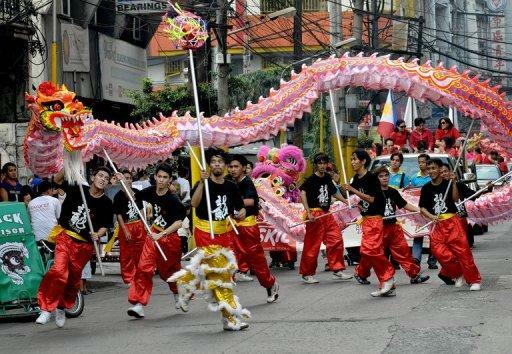 The Chinese New Year becomes one of 17 holidays that will be recognised by the Philippines in 2012 including Christian holidays such as Christmas and Easter and Muslim holidays Eid al-Adha and Eid al-Fitr. Scholars say about two percent of the Philippine population is Chinese. But many prominent families, including Aquino's clan, have Chinese ancestry and the Chinese New Year is a peak season for Hong Kong and Chinese tourists to come to the Philippines.